Our guest blogger Jean M Johnson reports from a recent trip running courses for chemistry teachers and students in Uganda. Limited in travel by a outbreak of the Marburg virus Jean taught her first local A-level class. 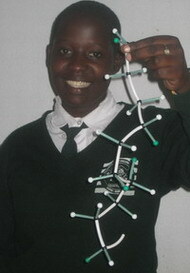 Topics included polymerisation and a look at carbon structures. Presence of the Marburg virus (similar to Ebola) prevented expansion of molecular model use at our main chemistry training centre at Bukinda, Kabale district, SW Uganda (not far from Rwanda) so we tried out the models with the first ever group of girls about to sit A level chemistry in Kihihi, not far from Congo. 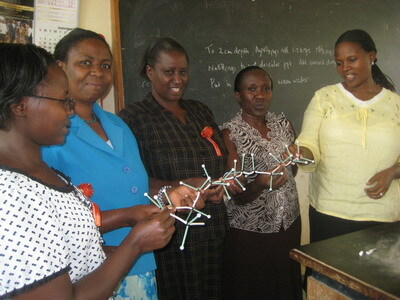 Our training has always included making a polyalkene chain by having various students (or teachers) make ethene models, then break the double bonds and form polythene or PVC as in 219. Now that we have many more C and H atoms, and appropriate bonds, we shall use larger alkene models, such as propene, for polymerisation. Students, even at undergraduate level in England, can find it difficult to draw the correct repeating unit when larger alkenes are polymerised and use of these models will help a lot. We also have enough atoms for students to compare single, double and tripe bonding of carbon, and to study structural and geometric isomers of simple hydrocarbons. Large quantities of atoms and bonds enabled us to make models of graphite (see picture below) and diamond, Janati (left) who we hope will act as technician from February, certainly got the idea of the graphite layers sliding over one another! Having seen the graphite rings it followed on naturally to make an S8 ring, and to revise the simple shape of H2S. Teacher Bahati made a model of an inorganic complex (see picture), but we realise we need to reassess which extra atoms are needed to make more complexes! It is our intention to develop use of models in Kihihi in February/March. Also, I made a fleeting first visit to a girls’ school in Lira, in the north, and left one box of models there. Hopefully, a team of us, with Regina, who has just done A Level, and started secondary education in a school run by Sr Clare, who is now in Lira, will be helping us.